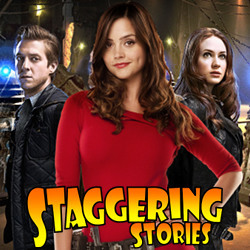 02:55 — Doctor Who: Five Doctors unite to help Janet Fielding. 04:44 — Amanda Tapping: Recuring role on Supernatural. 05:29 — Alfonso Cuarón & J.J. Abrams: New genre TV series. 07:25 — Manimal: Hollywood gets even more desperate. 10:10 — Doctor Who: Peter Jackson interested in directing? 12:17 — Quickfire Plug: Novelisation of the Rush ablum Clockwork Angels, out now! 12:28 — Quickfire Plug: Red Dwarf X starts on Dave, 9pm 4th October 2012. 12:38 — Quickfire Plug: Iain M Banks’ new Culture novel The Hydrogen Sonata published 9th October 2012. 12:41 — Quickfire Plug: Ben Aaronovitch’s Rivers of London novel, out for a while but still really, really good! 12:21 – Doctor Who: A Town Called Mercy. 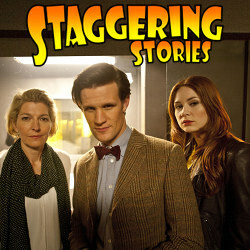 25:15 – Doctor Who: The Power of Three. 41:43 – Dredd (the 2012 film). 79:20 – Farewell for this podcast! 81:18 — End theme, disclaimer, copyright, etc. 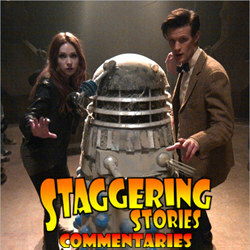 Adam J Purcell, Andy Simpkins and Keith Dunn sit down, nanogened, in front of the 2012 Doctor Who story, Asylum of the Daleks, and spout our usual nonsense! BBC: Doctor Who – Asylum of the Daleks. Wikipedia: Doctor Who – Asylum of the Daleks. 03:00 — Doctor Who: Another Hugo win, this time Neil Gaiman gets it. 03:46 — Steven Moffat: Twitter quitter. 04:52 — Joss Whedon: His Marvel TV series pilot called SHIELD. 05:47 — Red Dwarf: New series starts on the 4th October 2012 on Dave. 08:00 — DEAD: Michael Clarke Duncan and the legend Neil Armstrong. 09:13 — Jean Riddler: Finished her Olympic duties. 12:21 – Whooverville 4 Doctor Who convention. 20:40 – Doctor Who: Asylum of the Daleks and Dinosaurs on a Spaceship. 46:11 – Extreme Tea Duelling. 83:57 – Farewell for this podcast! 84:16 — End theme, disclaimer, copyright, etc.